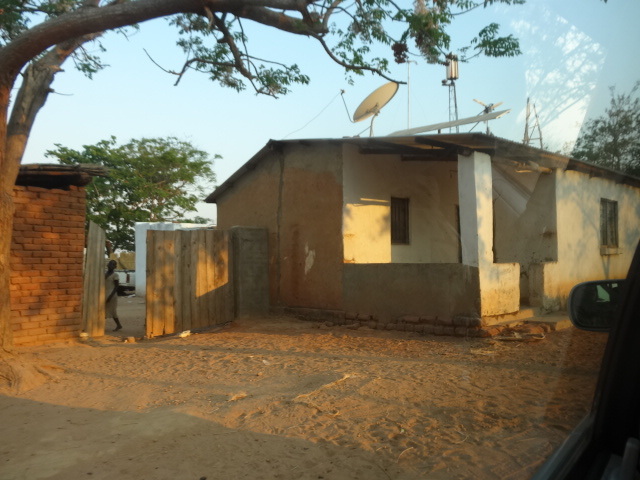 Harnessing the wind – a personal journey to Malawi. ← In the land of baobab trees. Five ample adults filling a small taxi, windows down, dust billowing, we bump and crawl along the dirt road to Wimbe in Kasungu district. In the tiny village, young men pause in their game of football to watch our passing. We reach a cluster of small dwellings, surrounded by a reed fence, hens scatter, ladies saunter by, resting large pots of food on their heads, only the presence of solar panels on the roof of the very humble house indicates we are somewhere quite out of the ordinary. And just visible are the windmills. William Kamkwamba’s education came to a halt at the age of 14 when he was sent home from school for failure to pay the fees. There was no money at home and famine was looming again. His story could have ended there but William possessed a determined and inquisitive mind. 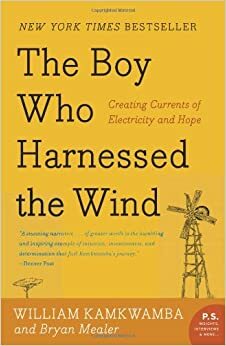 He dreamt of building a windmill which could generate power for his parents’ house and irrigation for the drought stricken land. 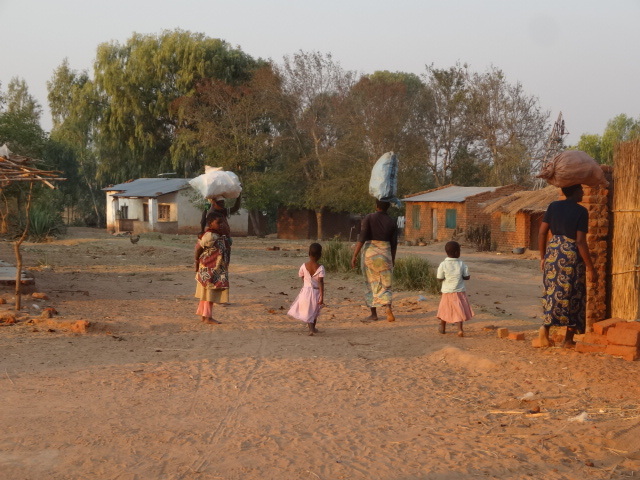 Malawi’s food supply is heavily reliant on maize. About 80% of the population work in agriculture. When harvests fail, there is no money to buy food. 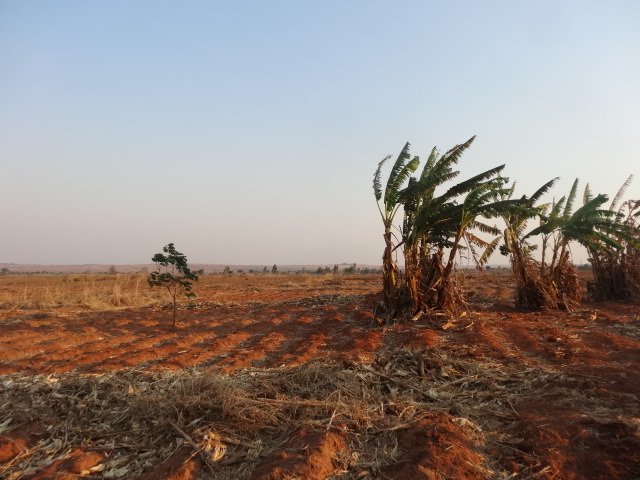 Soil fertility is poor and fertilizer has not always been cheap; some permaculture projects are in place. Sometimes there is drought, sometimes floods. The World Food Programme in 2012 reported that “households in parts of the country had harvested almost nothing”. 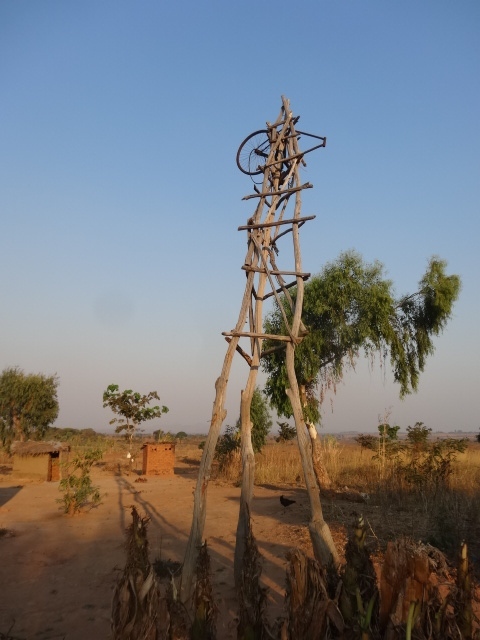 With barely a handful of food in his stomach each day, in 2002 , a time of desperate famine in Malawi, and old science textbooks his sole tool of learning, William created his first windmill out of old bicycles , tractor parts and scraps of metal scrounged where he could find them. His story became the subject of one of the most moving, and inspiring, books I have ever read. A true story of optimism and determination, a thirst for knowledge and self-improvement, in the most impoverished of circumstances. And here I am, outside his home, being graciously invited in by members of his family. I can hardly believe it. In William’s book, the characters of his parents are finely drawn. His father, a giant of a man, mostly a gentle giant, today sits on the house steps bouncing a chuckling child on his lap, politely taking our intrusion in his stride. 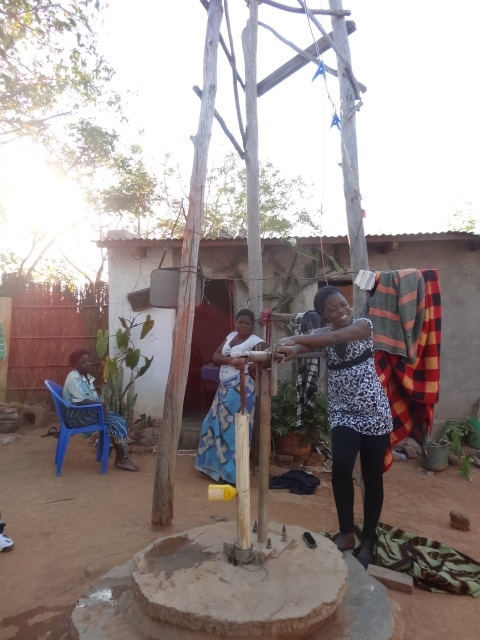 Groups of small barefooted children play happily, women busy themselves stirring the nsima, William’s sister arrives to demonstrate the new water pump and windmills William has installed in the yard. William’s sister at the water pump. His grandmother sits behind. His mother steps out of the house, a kind wise handsome face, a woman who has pulled her family through desperate times. My son speaks some Chichewa to her and she smiles and dives back into the house, emerging with a large Visitors’ Book, pages and pages filled with tributes, including one or two recognisable names. 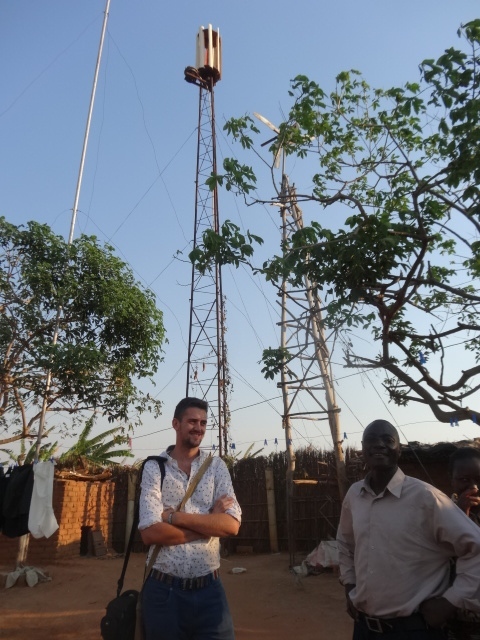 Pádraic MacOireachtaigh with Mr Zawanda, a teacher from Kasungu, in front of the new windmills. I glanced around the compound, before moving outside to see William’s original windmill. Apart from the solar panels and the water pump, there are no other signs of material wealth or possessions and yet there was a tangible sense of happiness, of contentment. A humbling experience, an unforgettable one. William’s story is a deeply uplifting one. I recommend the book wholeheartedly. We pile back into the taxi. It’s getting dark, in that swift way that happens in Africa. 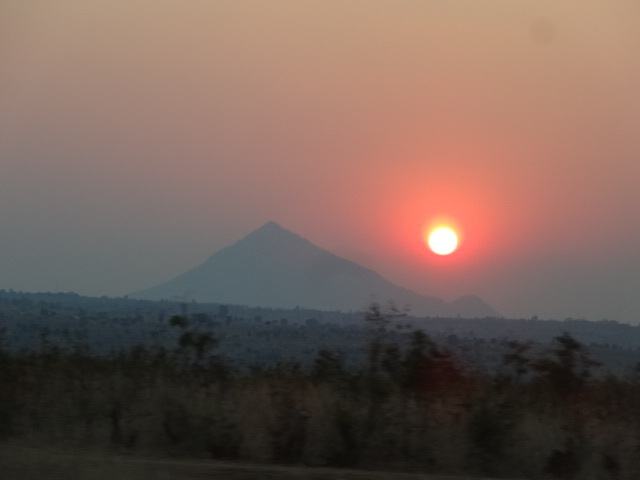 In the distance we can see the sun setting over Mount Kasungu. Thank you so much Christopher. I hope I did it justice. Thank you Jewels. The visit certainly put my life in perspective. Thanks Honey, an amazing story. My son worked in Malawi for two years which is how I heard of the book. I was delighted to visit the windmills, and his family, on this visit. What a wonderful and inspirational story! Thankyou for posting this. Matt, I’m really glad you liked the post. Always good to hear positive stories from Africa. Such an inspiring story! I’m so glad you shared this. Thanks Cindi. It was hard to convey the emotion on visiting this family. A very humbling experience. And William’s story is remarkable. I’m really glad you enjoyed it. I have read this remarkable book about this amazing young man. It’s an unforgettable story of a true hero. Annie, I’m so glad to hear it. I was very moved by the book too. An extraordinary story. Thank you very much Sylvia. I was delighted to be able to get to Wimbe. I really hope you get a chance to read the book – glad the post may have inspired you! A true innovator. Very heart-warming account, thanks for sharing. Many thanks, I’m glad you enjoyed it. What a moving story about William’s journey. And how marvelous that you were able to experience this visit to his family home. Many thanks Cynthia. I was so pleased to be able to visit his family and meet the people who featured memorably in his book.